Why Map Open Drainage? And How? What I can add to all of this is that in order to improve or at least start improving living conditions, you need to first know and understand the situation on the ground. 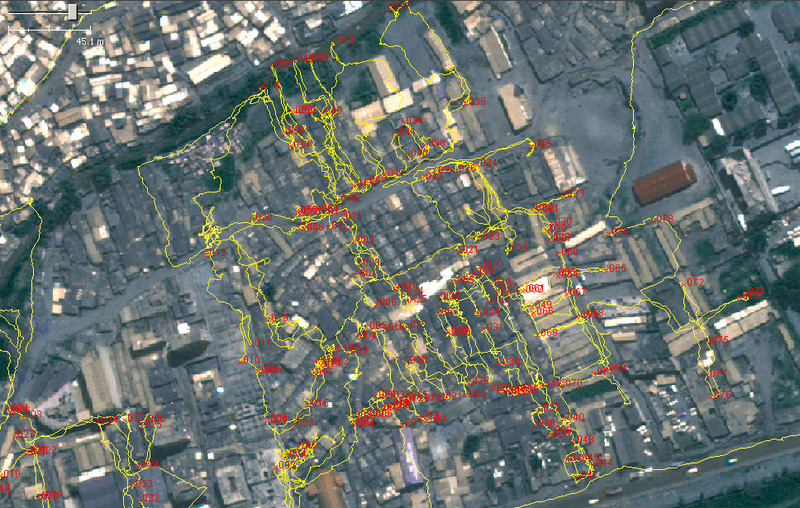 By mapping open drainage areas, our mappers are providing the first detailed geographical information about how open drainage is distributed throughout Kibera and Mathare, thus providing necessary information to anyone hoping to solve the problem. This I believe answers the question of why and brings me to the next question: How? Obviously open drainage creates “appalling living conditions,” but maybe not so obviously, it creates appalling mapping conditions too! Open drainage winds and curves between houses, often sinks below them, intersects, flows, stands, overflows, merges with the content of broken sewage lines (sewage lines burst and sewage comes above ground, mixing with the content of open drainage), and creates pools of standing water. 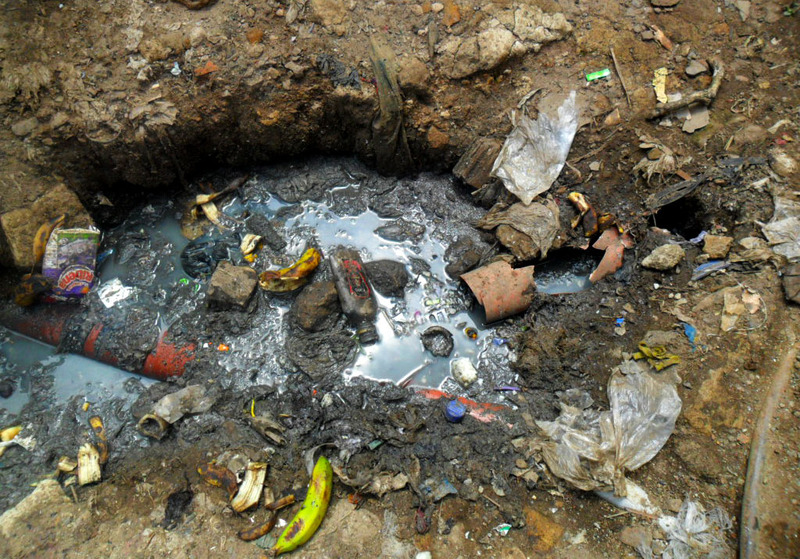 Open drainage is the main collector of garbage: garbage in open drainage areas often clogs drainage systems, thus creating floods during rains. All of this mesh slowly flows downwards, usually towards rivers that pick it up and carry it further downstream, polluting the environment sometimes hundreds of kilometers away. In order to understand the scale of the problem in Mathare and Kibera we went on an investigative – or, if I put it in army terms, reconnaissance – mission with our teams to see the problem first hand. Our participants surveyed the problem, and their input helped us to better understand what we’re up against. We walked through the slum evaluating different drainage lines and problems we faced in mapping them, Sebastien (our new volunteer) and I then facilitated the mappers to decide on which points of interest we should collect and in what order. 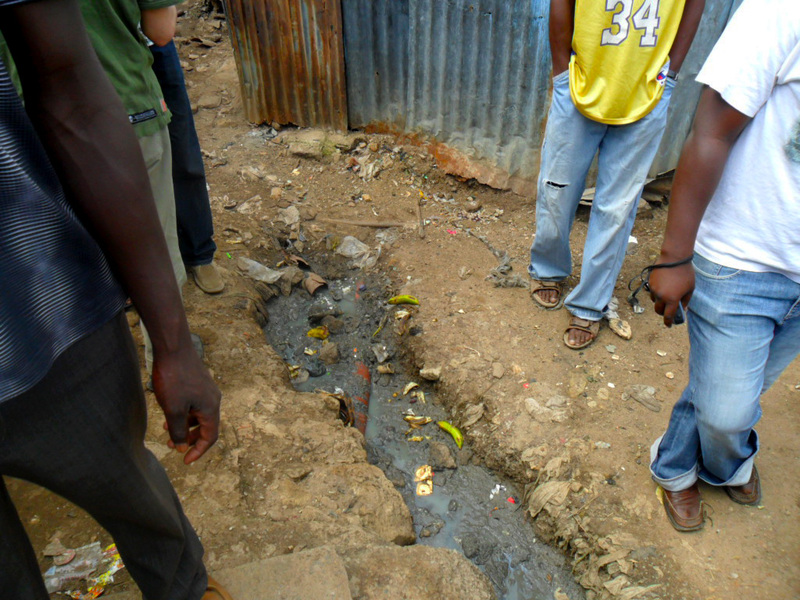 We came to realize that drainage systems in slums (Kibera, Mathare) basically work as micro river systems! This made us understand that it has to have an outlet, and both Kibera and Mathare have outlets in the form of rivers that run through them. All the drainage flows towards the rivers, so we started collecting data along the rivers. The next step is to collect data for the main channels, which lie along the main paths. After the extensive data collection we’ll use the satellite imagery and building extraction to help us determine the exact positions of drainage lines. Just knowing and understanding the situation will not make it better. This means that our process cannot end with mapping, but will take the map and the information we collect a step further to actually make the information useful and create an impact. The next step is bringing together community members, stakeholders, NGOs, local administration and government representatives and expose the problem with a method I like to call: “A punch in the face” – where we present the problem, with maps and other media, in all its vastness, and hopefully get some heads thinking and acting upon the information which is presented. The map lets stakeholders present problems to responsible actors in a comprehensive and difficult to ignore manner, making the issues more concrete than just words by providing detailed geographical representations of their scope and characteristics. 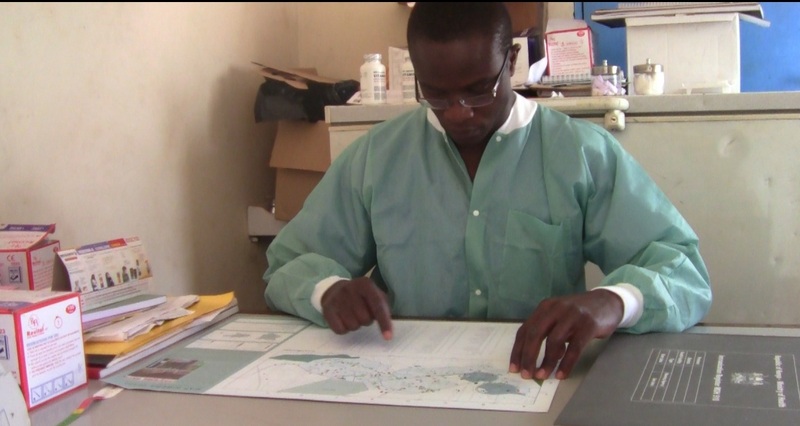 In order for this last step to be successful, local ownership, insights, and understandings of both the issues at hand and how mapping and presenting information can help bring change, is crucial. 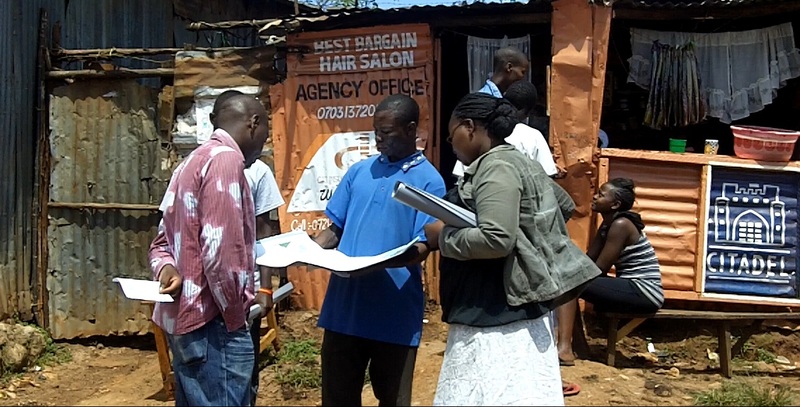 Creating this local ownership amongst key stakeholders – namely the local Map Mathare and Map Kibera teams – has to start from the very beginning of the process. We are working hard to create this local ownership from the beginning in Mathare and to bring a greater sense of ownership to the Kibera teams. 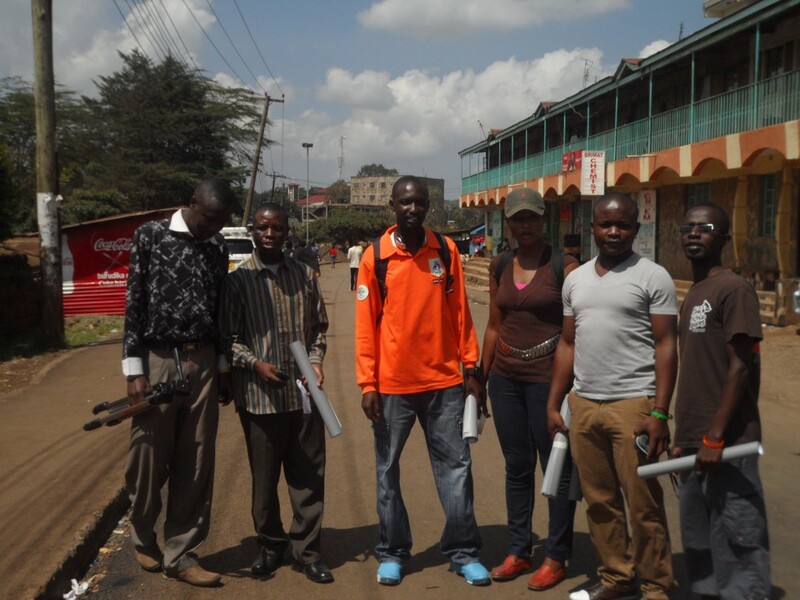 Map Kibera and Map Mathare are currently involved in vast mapping operations regarding Water and Sanitation in both Mathare and Kibera, two of the biggest slums in Nairobi. These projects are big as the issues they are trying to address and will present test whether exposing vast quantities of information about a particular issue truly has the ability to influence change. As I often say: Collecting data, as complicated and hard as it may be, is the easiest part here. You are currently browsing entries tagged with mapping at Map Kibera.